This is an account of our times, of this very year, young as it is – of positive turns to grim affairs, and of potential relapses. Hebdo and Kejriwal are actors certainly, but also potent symbols. Although much good is associated with them, and one hopes that they shall be conducive to human dignity, personal liberty and nominal equality, it appears that there is just the teeniest bit of rot in their ambits, which must be examined, if we are to stay true to the noble ideals of the early days of these two phenomena. Let us introduce the two protagonists, known to millions, but perhaps not to all, separated by some 6500 kilometers, and by a month, as far as major events in their respective lives are concerned. So far, so good. Beacons of hope burst on the horizon, and many millions gave them their trust, in France, India and – this is crucial – beyond provincial borders, for some of the ideas they stand for have near-universal validity, wherever Man is not in chains. They could do nothing wrong, one might have thought, for who would be base enough to abuse so much goodwill? Indeed, they have made no major transgression, but, even as they kept going in what some might believe is the right way, and certainly in keeping with the law of the land – they both did, in small measure, betray trust. Perhaps it is a minor aberration, and we may rest easy; but we must ask ourselves the question the background of which we shall now frame. First, Charlie. The highly sought-after issue following the terrorist attack proclaimed on its cover “Tout est pardonné” (“All is forgiven”). Within the covers of this 14 January 2015 edition was this sidebar which asked readers “why are you Charlie today”, following the outpouring of #jesuischarlie and a million placards in the black of mourning. As can be gathered from the image, the magazine seeks to suggest the various reasons people stood up for Charlie: for the freedom of the Press, for liberty, for personal freedom, freedom of expression (even when one does not agree with the voiced opinion), for the values of France, liberty and democracy, for liberty. All well and good, and impossible to argue with, if one is a lover of freedom. Consider now that the terrorists who attacked the Hebdo offices some weeks ago, although native Frenchmen, strongly identified themselves with a religion with roots in a faraway land, and adherents in many others. Paris too, like France and Europe, teems with many who reflect the ethnic stamp of those lands, as well as manner of dress and custom at meat. Not just those lands either: Paris is home to many who trace their recent ancestry to the East, the Far East, Africa and Latin America. This must be evident even to the casual visitor to the City of Lights who observes the dark-skinned young men loitering about the main entrance to the Gare du Nord, or those with almond-shaped eyes daintily sipping tea in the cafés, or headscarf-donning women with bearded husbands who closely fit the image associated with the noun “Arab”. Yet, none of those illustrated in the sketch above, from all those who Charlie sees as lovers of freedom, not one is dark-skinned, not one has almond-shaped eyes, not one is identifiably Muslim (this is a publication which knows all too well, and famously, how to create a two-dimensional sketch that is suggestive of a Muslim). The message appears to be clear – it is only we “true” Frenchmen and Frenchwomen who care for liberty and freedom; our co-habitants of other ethnicities, quite like those Muslims who came in with weapons on that fateful January day, may eat croissants and ride the Metro, but cannot possibly understand or respect freedom. Note that the figures do not represent any specific people – they are generic, the voice of the city, of the land; and they are the faces thereof too, else simple statements in quotation marks would have done the trick. It is sad that the entity we stood by as we shouted “Freedom” in various tongues would have taken so pernicious a stand. Perhaps the exclusion of those Who Do Not Look Like Us was not intentional – but it is scarcely likely that a professional cartoonist would choose a woman with blonde hair, one with red hair, a young man with dark hair, women with glasses, one with sunglasses, a child et cetera, but accidentally overlook anyone who looked vaguely as if they had an African, or Asian, or Arabian connection, with such widespread in Paris. Perhaps it is entirely innocuous, and these figures represent real people, randomly chosen – and in any case, it is 100% legal, and the magazine is free to portray, or even call for, a Paris, or even a France, free of dark-hued humans, or those who might pass for employees of the Korean embassy. In any case, a point could have been made: Charlie Hebdo could have included here a figure looking like a Muslim unequivocally standing for “Liberté”. That would have done justice to all those who stood by you, Charlie, to those who marched in various cities for the “values of France”, and those who showed support on Internet forums. Let us now consider the case of Mr. Kejriwal. A month after the “forgiving” Charlie Hebdo issue, he was sworn in as chief executive of the capital city of India, with a majority that meant there were no political roadblocks to implementing his election promises. A week or so later, a gentleman named Narottam Das, of Delhi but working for a police agency elsewhere, was killed by a landmine. He was not the only casualty, but the other policeman was not from Delhi, and so does not figure in the announcement made by Mr. Kejriwal as shown here. As with the Charlie Hebdo decision above, this one too is 100% legal. The Facebook post, with the photographs of humans vulnerable in their grief, has almost fifty thousand “likes”. Politician reaches out to hurt constituents – how could anyone object to that? The text may not be elegant, but the narrative is clear enough. Local boy is killed far from home, he was working for a police organization and so his death makes him a hero, we will stand by our boy, and will use government funds to pay to the family of the deceased a nice round sum, oh, and here’s a picture of grieving humans being comforted by me, the benevolent leader. As an aside, apart from being round, the sum is relatively non-trivial. 1 crore = 10 million rupees = 160,000 USD at current exchange rates. India’s nominal GDP per capita was USD 1500 in 2013, according to the latest Wikipedia entry. The sum mentioned, dispensed from the public purse in ad hoc fashion, is thus a hundred times the average annual income in the country, a country with many hungry mouths to feed. A mature, political response might be to enquire as to whether the policemen were equipped to deal with their opposition, in terms of material resources, training and intelligence; to delve into the causes of the conflict, and to encourage a socio-economic solution, perhaps, instead of military force. 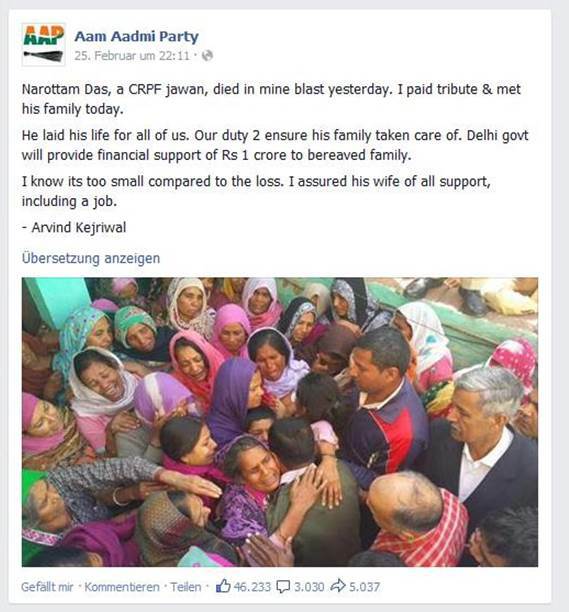 Instead, the Chief Minister of Delhi, he of the absolute majority, decides that the most efficient and humane way the Delhi government ought to use taxpayer money is by making a cash payment to a grieving family (cash and a photo opportunity exploited for Facebook; no statement on whether all future fatalities will be equally rewarded, or what of those who are killed but wear no policeman’s uniform). There is no denying that the cash is a boon for the family of the deceased, for it is no laughing matter to live in a brutal land after the removal of a breadwinner. However, Delhi is a city where naked men enter sewages to earn their keep, and this arbitrary giving away of taxpayer money reeks of shabby populism, and has little to do with efficiency or human dignity. Mr. Kejriwal’s personal immunity to venality, refreshing contrast to other politicians though it might be, is not enough. We need elected leaders to be responsible, and act to bring about sustainable positive change for the good of whole communities. Charlie Hebdo and Arvind Kejriwal, although the one is a magazine in Paris and the other a politician in Delhi, have one thing in common: they have become icons of hope for lovers of freedom and democracy, and have received the trust of millions. Foibles like the ones described here, although pandering to the majority and above board as far as lawyers are concerned, are not a generous recompense for that trust. This thesis may not resonate universally, but there is one thing we may all agree upon: giving our love and trust to icons does not absolve us of our responsibility to be vigilant, to enquire, to reflect, and to defend freedom, dignity and nominal equality, even from attacks instigated by sacred icons.